Over ten years ago I started a knitting club with some of my work friends and their spouses. Once a month we would meet at someone’s house for dinner, drinks, and knitting. We had a lot of fun knitting, talking, gossiping. We made lasting friendships over knitted works and wine. But, as life is wont to do, our lives got busier and busier, kids came along and people moved in and out of the group as some moved away and others moved to the area. It was harder to carve out the time to spend an entire evening at someone’s house especially because we all started having kids at a staggered rate. So, we devised a plan to just have dessert after dinner and kids were put to bed, we would have a little grown-up time to knit. That worked for a few years until even that became hard to coordinate. So, last year I decided to make the knitting club a lunchtime affair for anyone who wanted to knit once a week at work. So far, this has worked splendidly. So much so that we are trying to knit a little and eat a little together every day if we can. Besides, research shows that we definitely need to stop eating alone at our desks, which is what we were used to doing. 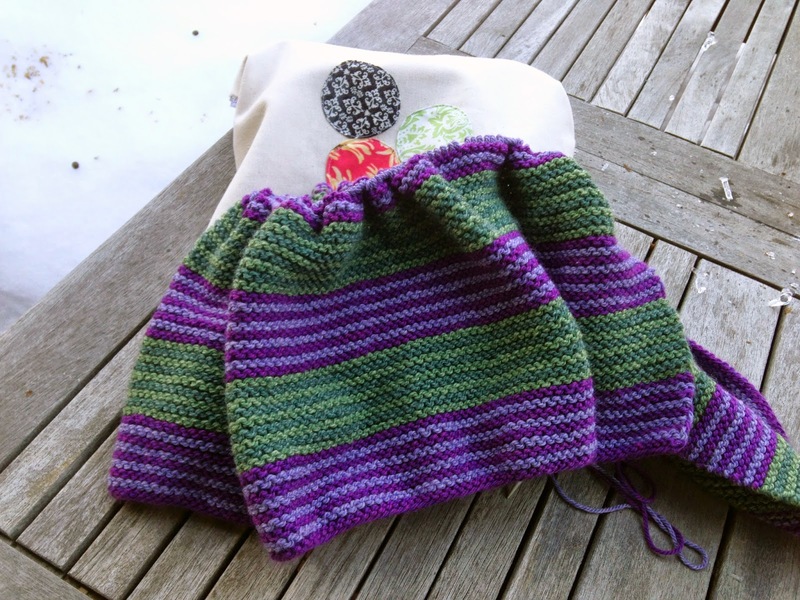 This long-winded explanation of my knitting club history is all to say that because we have started knitting at work, I wanted to create a project that could stay at work. One that was interesting enough to knit but mindless enough to be able to eat and talk and knit all at the same time. It needed to be large enough to last several months so I wouldn’t have to keep schlepping yarn to work. I also wanted it to have some meaning for my Museum, after all that is where we all work and knit. Cue an epic project that is inspired by my favorite work at the Museum, Jasmine Sidewinder by Gene Davis. I have loved this minimalist work since I first started working 20 years ago. It is large and interesting and STRIPES! The picture above doesn't really give you an idea of how tall it is. It is almost 10 feet tall!. I decided to replicate the artwork in a smaller version as a stole. 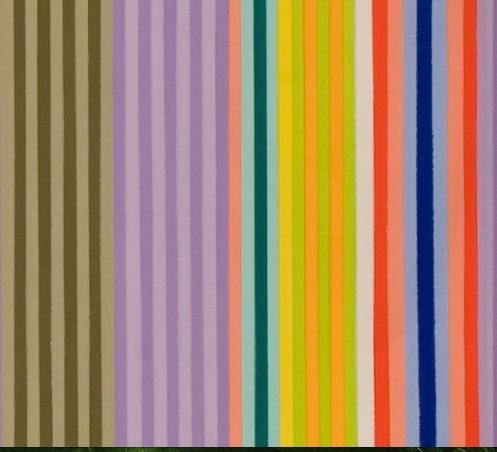 Garter stitch would make up the stripes and I would follow Gene Davis’ color scheme. After spending a lot of time browsing at my LYS, I decided to use Shepherd’s Wool from Stonehedge Fiber Mill, a) because it is incredibly soft wool, and b) because it had the wide range of colors that I needed. After a lot of swatching and math, I created a pattern and cast on last November. Over the last several months, I have knit row after row and seen it grow. A month ago I finally came to the colored stripes and freaked out over the weird colors. They looked very odd together and definitely not the combination or order of colors that I would ever put together. But, I trusted Gene Davis and his mastery of color and kept going. 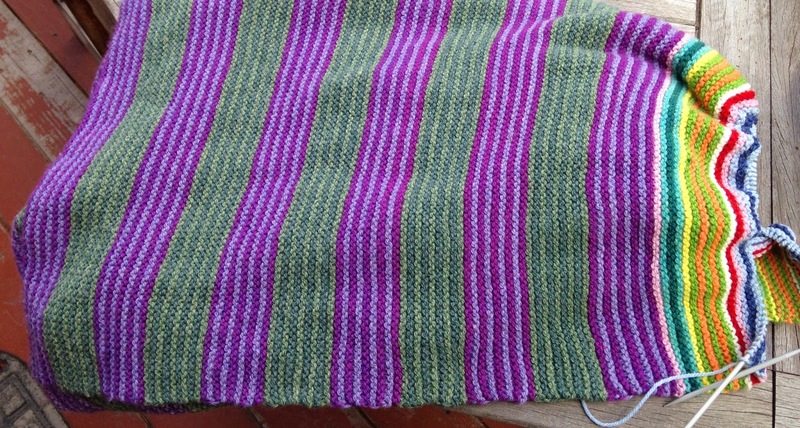 Now I am nearing the finish line and am almost ready to finish this stole. It has been a fun companion at work and has fulfilled all of my requirements of being interesting but easy, large enough to take a few months, and definitely inspired by our collection of art. So stay tuned in the next week or so for a finished stole, a pattern, and pictures.